The most interesting aspect of 2014's Divergent was its fundamental resistance to establishing its own story and world-building. Half the movie felt like a training montage with no particular goal in sight, occasionallyinterrupted by Shailene Woodley and Theo James being attractive at each other. This part was fabulous, because if training montages are their own cinematic reward, then romances are doubly so. Then arose the annoying intrusion of what the movie was actually about, and it became dumb and derivative of better material. The second chapter, Insurgent, has none of the respites of training and romance. The dialogue about the factions that provide its post-apocalyptic (so everyone thinks, anyway) world stability is endless, and artless. The world-building is too elaborate and literalized to function as straight metaphor, and too broadly and shallowly conceived to work as science fiction. The best level on which Divergent and Insurgent work—that of Tris (Woodley) and Four (James) being an unfathomably beautiful young couple in love—is marred by all the clutter. At its core, Insurgent is a basic construction almost identical to its presumptive inspiration, The Hunger Games: Teen girl fights fascism. This is a fine thing for teen girls to do, and for the actors playing them in movies to be seen doing by other teen girls, who might learn to fight fascism, too. But the thing that makes the Hunger Games cycle better—especially as movies—is their lack of clutter. The Divergent world is seemingly nothing but. Insurgent does at least answer one question its predecessor omits: How can everyone in a city fit into five different, and quite specific, personality types? 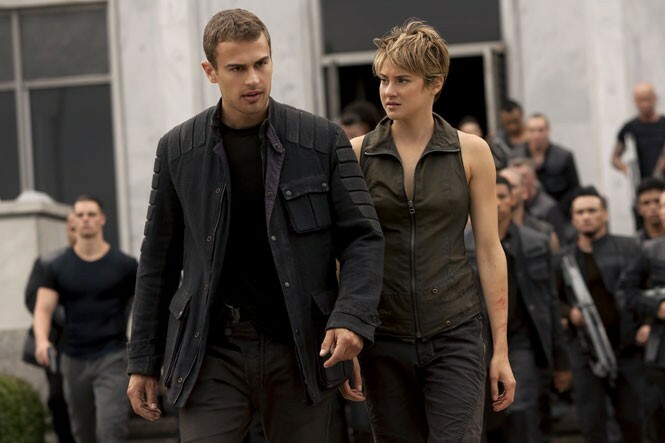 Divergent mentions "factionless" people, and implies that there aren't very many of them, but Insurgent clarifies that there are massive numbers of "factionless." So massive, in fact, that another unanswered question manifests: If there are so many of them, and they're so discontented, why have they not already rebelled? (There may be a reason given in the books, but if so, it did not make it to the screen.) And once one interrogative thread is pulled, the whole movie starts to unravel, since this is not a scenario that holds up under scrutiny. Nor do the actions of the characters, which frequently seem completely arbitrary. The lack of coherence manifests itself in the filmmaking as well. Robert Schwentke (RED) takes over as director from Neil Burger, but falls short of his predecessor's clean arrangement of bodies in space. The action in Insurgent is particularly bad, with cutting implying at times that it takes a phalanx of soldiers five minutes to run across a room. Additionally, it's rarely clear whether people are shooting one another with bullets or knockout darts until it becomes evidentthis actor or that actor won't be returning. All of this calls even more unwanted attention to the drab production design and the odd way everything in Chicago is suddenly with walking distance of everything else, and despite the presence of a totalitarian autocracy, wanted political dissidents always get where they want to go with only the most perfunctory of subterfuges. Despite not being given a lot to work with, Woodley and James manage to power through on sheer charisma, even carrying Insurgent through numerous passages of utter gibberish. Kate Winslet as a villainous despot displays no more sign of being an organic life form than she did in the first movie (and, for an "Erudite," she does dumb things almost exclusively). Naomi Watts' character might as well be the same person with a brunette dye job and a prole-ier wardrobe, though Watts and Winslet do what they can under the circumstances. Miles Teller thrives again as essentially the comic relief, although his character's very presence in the story defies reason (perhaps owing to more material from the books that didn't make it to the screen). The reality is that little of the above matters. Insurgent is going to make a large pile of money, and moviegoers who have heard of it already know whether they're interested in seeing it or not. The story is gibberish, the world poorly conceived and the directing middling to poor, yet there are worse and more harmful ways to spend two hours. Like playing a drinking game where you down a shot every time someone says the word "divergent." Do not do this. The Divergent Series: Insurgent is not showing in any theaters in the area.